Zing Introduces Stikbot Studio Pro! You are here: Home / Sponsored / Zing Introduces Stikbot Studio Pro! Built on the success of Stikbot, a stop-motion animation superstar designed to turn kids into moviemakers, Zing is introducing Stikbot Studio Pro, a new set with the capacity to shape kids imagination into endless possibilities! Stikbot Studio Pro takes stop-motion animation creations to the next level. This set includes a green screen stage, allowing the user to easily upload their own photos, videos and animated backdrops as the background to their stop-motion movie. It’s the ultimate green screen on-the-go! Have a green Stikbot? Flip the set and use the blue screen. With the included prop boxes, users can easily create a 3-D affect, allowing your film to take place anywhere and everywhere! The FREE Zing StikBot Studio app, available on iOS & Android, snaps individual photos and stitches them together into a film, complete with built in music, sound effect options and now animated backdrops. Stikbot are easy-to-pose figures, built with suction cup hands and feet, which can stick to almost any flat surface. Stop motion storytelling is bigger than ever. The hashtag is today’s conversation; and social sharing is how kids communicate now, by creating pictures and videos and sharing them with their friends. It’s today’s new “traditional play pattern.” Share your creations on social media using #Stikbot and see what others are making all over the world! 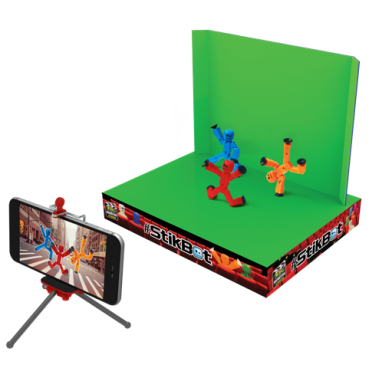 Stikbot Studio Pro includes two solid colored Stikbots, one tripod, one green screen/blue screen and 2 green/blue screen blocks.